Video is the first definitive proof of life since the nearly 300 girls were kidnapped. Islamists claim they have 'converted to Islam'. One month ago, Islamic terrorist organization Boko Haram abducted nearly 300 students from a Nigerian girls' boarding school, most of them Christians, in a move which set off protests around the world. On Monday, a video surfaced showing evidence that about 130 of them are alive - providing proof of their survival for the first time. Rows of veiled girls sit in the video, chanting and singing in front of what looks to be an Al Qaeda flag. Boko Haram leader Abubakar Shekau then appears, insisting that the girls have converted to Islam. 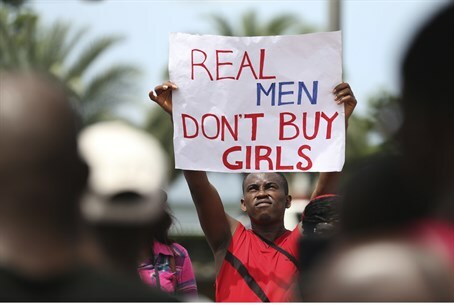 International attention has flared over the missing girls and a viral campaign, #bringbackourgirls, spread quickly through social networking sites and inspired several high-profile protests, including one headed by Hollywood icon Anne Hathaway and another by US First Lady Michelle Obama. Earlier this month, Shekahu released another chilling video, claiming that "Allah told him" to sell the girls into slavery. According to a Nigerian paper at least 50 of the girls were reportedly spotted in the Central African Republic earlier Monday, escorted by armed terrorists. Boko Haram has been responsible for scores of terrorist atrocities in Nigeria, usually against Christian and government targets, but also occasionally against Muslim figures who oppose them. "Boko Haram" translates literally as "Western education is forbidden" in the Hausa language prominent in Nigeria's Muslim-majority north, reflecting the group's opposition to any non-Muslim or western influence in the country, including within its education system. The mass-kidnapping, which took place in April, was not the group's first attack on a school. Just two months ago, the group shot and burned to death dozens of students in an attack on a boarding school. Israeli Prime Minister Binyamin Netanyahu offered on Sunday to help Nigeria with the current crisis, in a series of conversations with Nigerian President Goodluck Jonathan. Jonathan has formally accepted the offer to find the missing girls.